In the decades since Jessica Mitford stunned America with her expose of the death industry, there has been far too little progress. At a time of intense grief, families are lied to and bullied into buying expensive goods and services they don't want or can't afford. Prepaid funeral money disappears into thin air. Body parts are sold on the black market. Eight states force families to pay a funeral director when a loved one dies - even if they have a home funeral. But a funeral consumer movement is awakening. Having obtained rights to natural childbirth and end-of-life hospice care, Americans are insisting on taking charge of another major and intimate life event. Many will want to pay a funeral director to assist - but not direct. And increasing numbers are handling arrangements themselves - with home burials, green burials, or direct arrangements with a crematory. The two most prominent leaders of this movement are Joshua Slocum and Lisa Carlson. 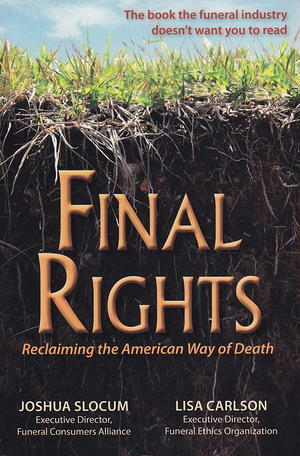 Both are widely sought by journalists, lawyers, and legislators for their expertise on funeral issues. In this book, they join forces to expose the pervasive misdeeds of the industry, inform families of their rights, and urge legal reforms. A comprehensive summary of information is included for each state.